PUTTING YOUR MONEY WHERE YOUR TIRES (sic) IS by Jim Corbran, Automotive Columnist Right about now I’ll bet there are a few of you out there rueing the choice you made last time you were car shopping. Especially if it was done during more, ahem... pleasant weather. If you’re like me you’ve never had any interest whatsoever in driving a pickup or an SUV. But that all- or four wheel-drive has been sounding mighty tempting lately. Rejoice! There ARE all-wheel drive systems available out there in coupe, wagon, and four-door sedan body styles. Today we’ll explore some options for those of you who are more interested in the traditional American automobile. Like fr’instance, the Chrysler. The very attractive mid-sized 200 offers AWD in two models: the 200S ($29,025) and the 200C ($30,525). They both come equipped with a 3.6L V-6 and a nine-speed automatic transmission. As you can guess from the pricing, the 200C has more standard equipment. Chrysler also offers AWD in the larger 300 series, which runs through the entire range: Limited, 300S, 300C, and 300C Platinum. Pricing starts at $35,590 and runs on up to $44,895. The 300’s AWD models all come equipped with the Pentastar 3.6L V-6 and an eight-speed automatic. You can get more info on the 200 and 300 at chrysler.com Ford offers AWD in both the mid-size Fusion and larger Taurus four-door sedans. On the Fusion you can choose between the mid-level SE or the top-line Titanium, both with a 2.0L EcoBoost and the six-speed SelectShift automatic. Fusion AWD pricing starts at $28,325 for the SE, and $32,290 for the Titanium. Taurus AWD models are the mid-ranged SEL ($31,335) and Limited ($36,255), and the top-line performance model SHO ($40,220). All come with a 3.5L EcoBoost V-6, the SHO’s having 365 hp, while the others are rated at 288 hp. More info is available at ford.com. General Motors is represented by both the Cadillac and Buick in the AWD category. 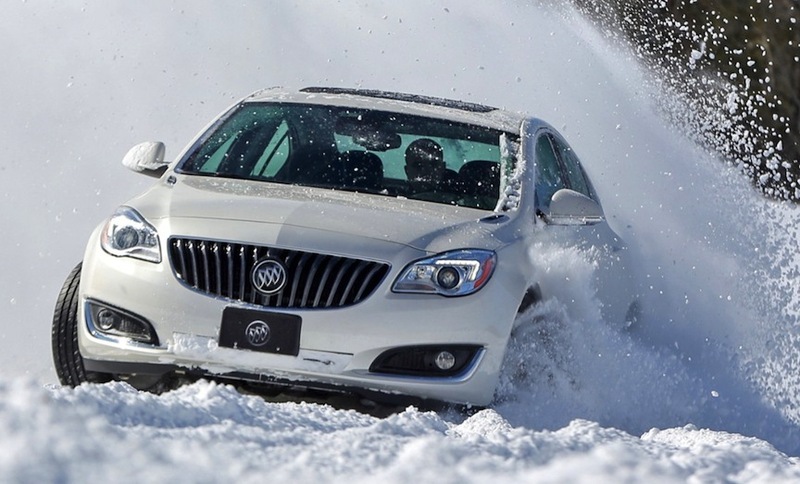 The mid-sized Buick Regal offers AWD throughout the line starting with its Base model and on up through the Premium I and II packages. A 2.0L turbocharged engine is under the hood of all three, while the transmission is a six-speed automatic. Pricing ranges from $33,340 to $37,450. The full-sized Buick LaCrosse also offers AWD along with a 3.6L V-6 and a six-speed automatic. The LaCrosse comes in two trims: Leather ($39,665) and Premium I ($41,425). Full details can be had at buick.com Lastly, Cadillac offers AWD on both coupes and four-doors. The compact ATS coupe (starting at $41,440) and sedan ($38,240), and the mid-sized CTS sedan (starting at $48,340), all offer both luxury and performance in a good old American package. Read all about them, and build your own, at cadillac.com Now get out there and warm up the snowblower! ### Jim Corbran, Automotive columnist for Artvoice Read You Auto Know every other week in Artvoice, and check the YAK blog daily here: http://blogs.artvoice.com/avdaily/category/you-auto-know/ The post PUTTING YOUR MONEY WHERE YOUR TIRES (sic) IS appeared first on Buffalo Cars.